The Datastore contains all Guardian, Anti-Spam, and web traffic log files, as well as the resulting file indexes used for reporting. You can use the Datastore settings page to view current disk usage, displayed as a pie chart, as well as estimated future disk usage. 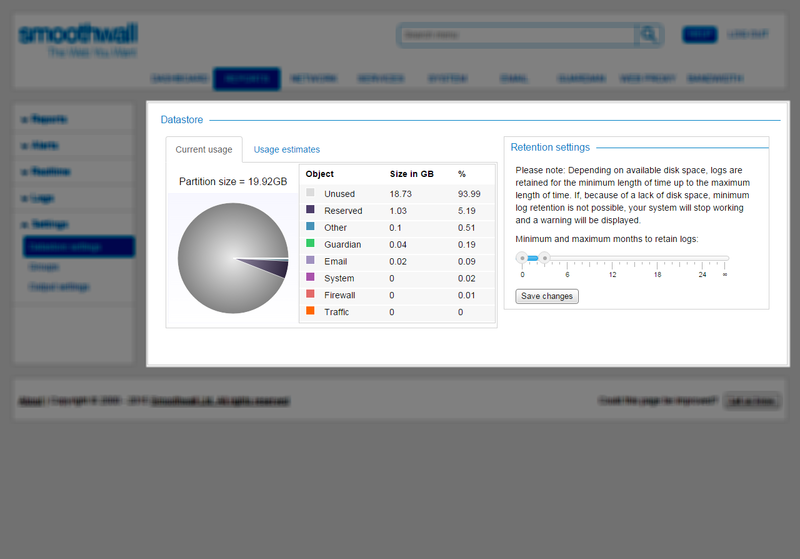 The Smoothwall System estimates the amount of disk space required by the Datastore to store one month, three months, six months and one years worth of data. This estimation is based upon an average of the last 31 days worth of log data. Based on this estimate, the Smoothwall System makes a further estimation of the number of months data that can be stored before the disk's log partition is full, and automatic pruning occurs. You can use this estimate to specify the length of time the log files are kept for. 1. Go to Reports > Settings > Datastore settings. • The minimum number of months possible is 0. If a log file is older than the minimum retention period specified, it may be deleted if storage space starts to run out. • The maximum number of months possible is infinite. If a log file is older than the maximum retention period specified, it will be deleted. For example, if the minimum retention period is set to 3 months and the maximum retention period is set to 6 months, the Smoothwall System will always keep log files for 3 months and, if there is available storage space, will keep them for 6 months. Note: If, because of a lack of disk space, the minimum log retention is not possible, the Smoothwall System stops working and displays a warning.